1 2 3 4 5 "Status of ratification". UNFCC Homepage. Retrieved 5 June 2012. 1 2 "7 .a Kyoto Protocol to the United Nations Framework Convention on Climate Change". UN Treaty Database. Retrieved 27 November 2014. ↑ "7 .c Doha Amendment to the Kyoto Protocol". UN Treaty Database. Retrieved 19 April 2015. ↑ "Kyoto Protocol to the United Nations Framework Convention on Climate Change: Annex B". United Nations Framework Convention on Climate Change. n.d. Retrieved 8 October 2011. ↑ "United Nations Framework Convention on Climate Change". United Nations Framework Convention on Climate Change. Retrieved 23 July 2016. ↑ US National Research Council (2001). "Summary". Climate Change Science: An Analysis of Some Key Questions. Washington, D.C., U.S.A.: National Academy Press. p. 3. 1 2 US National Research Council (2008). Understanding and Responding to Climate Change (PDF). Board on Atmospheric Sciences and Climate, US National Academy of Sciences. p. 2. 1 2 3 IPCC (2007). "3. Projected climate change and its impacts". In Core Writing Team (eds. ); et al. Summary for Policymakers. Climate Change 2007: Synthesis Report. Contribution of Working Groups I, II and III to the Fourth Assessment Report of the Intergovernmental Panel on Climate Change (IPCC). Cambridge University Press. ↑ Temperatures are measured relative to the average global temperature averaged over the years 1980-1999, with the projected change averaged over 2090–2099. 1 2 3 Karl, T.R. ; et al., eds. (2009). "Global climate change". Global Climate Change Impacts in the United States. 32 Avenue of the Americas, New York, NY 10013-2473, USA: Cambridge University Press. ISBN 978-0-521-14407-0. ↑ United Nations Framework Convention on Climate Change (UNFCCC) (2011a), Status of Ratification of the Convention, UNFCCC Secretariat: Bonn, Germany: UNFCCC . Most countries in the world are Parties to the United Nations Framework Convention on Climate Change (UNFCCC), which has adopted the 2 °C target. 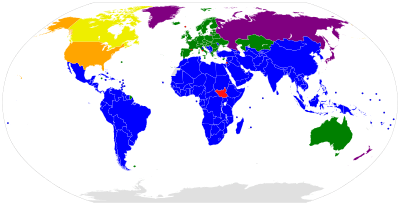 There are currently (as of 25 November 2011) 195 Parties (194 states and 1 regional economic integration organization (the European Union)) to the UNFCCC. 1 2 3 4 IPCC (2001d). "Question 1". In Watson, R.T.; the Core Writing Team. Climate Change 2001: Synthesis Report. A Contribution of Working Groups I, II, and III to the Third Assessment Report of the Intergovernmental Panel on Climate Change (IPCC). Cambridge University Press. 1 2 Grubb, M. (2004). "Kyoto and the Future of International Climate Change Responses: From Here to Where?" (PDF). International Review for Environmental Strategies. 5 (1): 2 (PDF version). 1 2 3 Gupta, S.; et al. (2007). "13.3.1 Evaluations of existing climate change agreements. In (book chapter): Policies, instruments, and co-operative arrangements.". In B. Metz; et al. Climate Change 2007: Mitigation. Contribution of Working Group III to the Fourth Assessment Report of the Intergovernmental Panel on Climate Change. Print version: Cambridge University Press, Cambridge, UK, and New York, N.Y., U.S.A.. This version: IPCC website. Retrieved 2 April 2010. 1 2 Meehl, G. A.; et al. (2007). "FAQ 10.3 If Emissions of Greenhouse Gases are Reduced, How Quickly do Their Concentrations in the Atmosphere Decrease?". In Solomon, S.; et al. Global Climate Projections. Climate Change 2007: The Physical Science Basis. Contribution of Working Group I to the Fourth Assessment Report of the Intergovernmental Panel on Climate Change. Cambridge University Press. ↑ Intergovernmental Panel on Climate Change (IPCC) (2007). "Human and Natural Drivers of Climate Change". In Solomon, S.; et al. Summary for Policymakers. Climate Change 2007: The Physical Science Basis. Contribution of Working Group I to the Fourth Assessment Report of the IPCC. Cambridge University Press. 1 2 Liverman, D. M. (2008). "Conventions of climate change: constructions of danger and the dispossession of the atmosphere" (PDF). Journal of Historical Geography. 35 (2): 279–296. doi:10.1016/j.jhg.2008.08.008. Retrieved 10 May 2011. ↑ The benchmark 1990 emission levels accepted by the Conference of the parties of UNFCCC (decision 2/CP.3) were the values of "global warming potential" calculated for the IPCC Second Assessment Report. 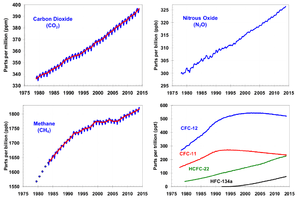 These figures are used for converting the various greenhouse gas emissions into comparable carbon dioxide equivalents (CO2-eq) when computing overall sources and sinks. Source: "Methodological issues related to the Kyoto protocol" (PDF). Report of the Conference of the Parties on its third session, held at Kyoto from 1 to 11 December 1997, United Nations Framework Convention on Climate Change. 25 March 1998. Retrieved 13 February 2010. ↑ "Industrialized countries to cut greenhouse gas emissions by 5.2%" (Press release). United Nations Environment Programme. 11 December 1997. Retrieved 6 August 2007. ↑ Clifford Chance LLP (2012). "Clean Development Mechanism: CDM and the UNFCC" http://a4id.org/sites/default/files/user/CDM%26UNFCCCcorrected.pdf . Advocates for International Development. Retrieved: 19 September 2013. 1 2 3 4 5 6 7 8 9 10 11 12 13 Hood, C. (November 2010). "5. Current and proposed emissions trading systems" (PDF). Review Existing and Proposed Emissions Trading Systems: Information paper. Head of Publications Service, 9 rue de la Fédération, 75739 Paris Cedex 15, France: International Energy Agency (IEA). Retrieved 7 July 2011. 1 2 3 4 5 6 7 8 Carbon Trust (March 2009). 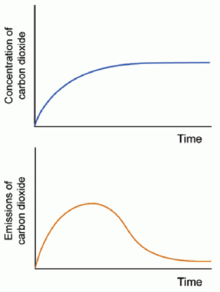 "Global Carbon Mechanisms: Emerging lessons and implications (CTC748)". Carbon Trust website. Retrieved 31 March 2010. ↑ World Bank (2008), Development and Climate Change: A Strategic Framework for the World Bank Group: Technical Report, Washington, DC, USA: The International Bank for Reconstruction and Development / The World Bank. ↑ Hourcade, J.-C.; et al. (2001). "8.3.1.1 "Where Flexibility"". In B. Metz; et al. 8. Global, Regional, and National Costs and Ancillary Benefits of Mitigation. Climate Change 2001: Mitigation. A Contribution of Working Group III to the Third Assessment Report of the Intergovernmental Panel on Climate Change. Cambridge University Press. p. 538. ↑ World Bank (2010). "World Development Report 2010: Development and Climate Change". The International Bank for Reconstruction and Development / The World Bank, 1818 H Street NW, Washington DC 20433. Retrieved 6 April 2010. ↑ "The Kyoto protocol – A brief summary". European Commission. Retrieved 19 April 2007. ↑ "Kyoto Protocol". UNFCCC. 14 May 2008. Retrieved 21 May 2009. ↑ Maljean-Dubois,, S. "Compliance with the Kyoto Protocol on Climate Change". Synthèse, n° 01, 2007. Institute for Sustainable Development and International Relations. ↑ "An Introduction to the Kyoto Protocol Compliance Mechanism". UNFCC. Retrieved 30 October 2006. ↑ "The Kyoto Protocol full text (PDF)" (PDF). UNFCC Homepage. ↑ "European Union ratifies the Kyoto Protocol" (Press release). European Union. 31 May 2002. Retrieved 13 February 2010. ↑ West, Larry. "What is the Kyoto Protocol". About.com (Part of NYT). Retrieved 5 June 2012. ↑ "Kyoto Protocol: Status of Ratification" (PDF). United Nations Framework Convention on Climate Change. 14 January 2009. Retrieved 6 May 2009. ↑ "Congressional Research Service Reports #98-349: Global Climate Change: Selected Legal Questions About the Kyoto Protocol". ↑ "Clinton Hails Global Warming Pact". All Politics (CNN). 11 December 1997. Retrieved 5 November 2006. 1 2 "Canada pulls out of Kyoto protocol". The Guardian. 13 December 2011. Retrieved 13 December 2011. ↑ "Canada withdrawing from Kyoto". The Toronto Star. 12 December 2011. Retrieved 12 December 2011. ↑ Ljunggren, David; Palmer, Randall (13 December 2011). "Canada to pull out of Kyoto protocol". Reuters. Financial Post. Retrieved 9 January 2012. 1 2 "Canada under fire over Kyoto protocol exit". BBC News. 13 December 2011. ↑ "Kyoto Protocol to the United Nations Framework Convention on Climate Change". Ministry of Foreign Affairs (Netherlands). Retrieved 30 December 2012. ↑ Emissions data given in this table may not fully reflect progress towards the first-round Kyoto targets. This is because of the implicit trading of targets under the EU ETS (see Kyoto Protocol#Intergovernmental Emissions Trading), possible effects of trade in AAUs (see Kyoto Protocol#Trade in AAUs), and the use of different emissions base years for some Parties (see Kyoto Protocol#2012 emission targets and "flexible mechanisms"). ↑ StarTribune - Canada formally pulls out of Kyoto Protocol on climate change Retrieved 4 May 2012. ↑ Monaco's CO2 emissions from fuel combustion are included with France's. 1 2 Vaughan, A (13 December 2011). "What does Canada's withdrawal from Kyoto protocol mean?". The Guardian. Retrieved 17 December 2011. ↑ PBL (16 October 2009). "Industrialised countries will collectively meet 2010 Kyoto target". Netherlands Environmental Assessment Agency (PBL) website. Archived from the original on 9 April 2010. Retrieved 3 April 2010. ↑ Barker, T.; et al. (2007). "Mitigation costs across sectors and macro-economic costs". In Metz, B.; Davidson, O. R.; Bosch, P. R.; Dave, R.; Meyer, L. A. Technical summary. Climate Change 2007: Mitigation. Contribution of Working Group III to the Fourth Assessment Report of the Intergovernmental Panel on Climate Change. Print version: Cambridge University Press, Cambridge, United Kingdom and New York, NY, USA. This version: IPCC website. ISBN 978-0-521-88011-4. Retrieved 16 April 2011. ↑ International Energy Agency (IEA). CO2 Emissions from Fuel Combustion - 2011 Highlights (PDF). Paris, France: IEA. p. 12. ↑ Aldy, J. E.; et al. (9 September 2003). "Thirteen Plus One: A Comparison of Global Climate Policy Architectures". Climate Policy. 3 (3): 373–397. doi:10.1016/j.clipol.2003.09.004. Retrieved 2 April 2010. ↑ Grubb, M. (April 2000). "The Kyoto Protocol: An Economic Appraisal. FEEM Working Paper No. 30 2000". SSRN. doi:10.2139/ssrn.229280. SSRN 229280 . ↑ "Govt still not serious about climate change: Labor". ABC News Online. 26 October 2006. Retrieved 30 October 2006. ↑ "Rudd takes Australia inside Kyoto". BBC News. 3 December 2007. Retrieved 5 December 2007. ↑ "Australia's Rudd sworn in as PM". BBC News. BBC. 3 December 2007. Retrieved 3 December 2007. ↑ "Politicians sign new climate pact". BBC. 16 February 2007. Retrieved 28 May 2007. ↑ "Global leaders reach climate change agreement". The Guardian. UK. 16 February 2007. Retrieved 28 May 2007. ↑ Adam, David (25 March 2009). "Why the Copenhagen climate change cliffhanger could drag on a little longer". The Guardian. Retrieved 14 April 2009. ↑ Adam, David (14 April 2009). "World will not meet 2C warming target, climate change experts agree". The Guardian. Retrieved 14 April 2009. The poll comes as UN negotiations to agree a new global treaty to regulate carbon pollution gather pace in advance of a key meeting in Copenhagen in December. Officials will try to agree a successor to the Kyoto protocol, the first phase of which expires in 2012. ↑ Murray, James (16 May 2012). "Bonn climate talks: EU plays down talk of Kyoto protocol rift". The Guardian. Retrieved 21 November 2012. A number of large emitters, including the US, Japan, Russia, and Canada, have signalled they will not sign up to Kyoto or to a second commitment period of Kyoto, while large emerging economies will only sign up to an agreement that does not impose binding emission reduction targets on them. ↑ Harvey, Fiona (9 November 2012). "Kyoto protocol: Australia signs up to second phase". The Guardian. Retrieved 21 November 2012. ↑ "Groser defends quitting Kyoto Protocol". 3 News NZ. 3 December 2012. ↑ "NZ's climate reputation 'nosedive'". 3 News NZ. 10 December 2012.